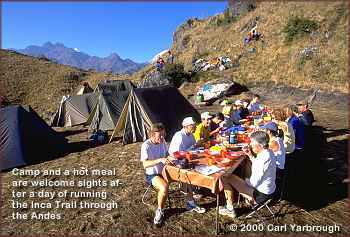 Andes Adventures: "Peru On The Run" By Ken McAlpine. Photography by Carl Yarbrough. To truly understand a place, you must see it through many eyes: your own, those of your fellow travelers, the locals you meet, and the locals you never will. Do this, and you may come home with your perspective forever changed. There you have the magic of travel. Keeping your eyes open has practical benefits, too. Say, when you are jogging along a narrow, rock-strewn trail bordered on one edge by free-fall space spiraling far, far down to a ribbon of smoky river that could cradle your broken body and sweep you northward through Peru until you join the Amazon, and eventually the Atlantic Ocean. 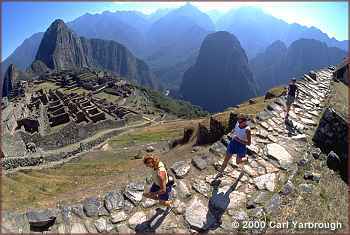 Perhaps the only thing more mind-bending than the thought of that epic journey is the Inca Trail on which I now jog. Carved into the side of the mountain, the trail looks out to higher mountains still. These are covered with snow and here, in late afternoon, are cloaked in dark clouds shot through with misty gold bands of sunlight. While the Spanish who conquered the Incas simply coveted the stuff, gold was, to the Incas, the teardrops of the sun. This trail is but a fraction of a vast 14,000-mile network that, in the words of one dumbstruck Spanish conquistador, "excels the constructions of Egypt and the monuments of Rome." More numbing still, no one will ever really know how this vast web of trails and the cities and temples they linked were constructed. The Incas did not keep records, and their Spanish conquerors, intent on wiping out all reminders of Inca presence, would not have left them intact if they did. What is known is this: An Inca messenger, chasqui in the Quechua language, probably ran this very trail 500 years ago, headed, maybe, as we are, to Wayllabamba, or Ollantaytambo, or perhaps the legendary city of Machu Picchu. And he did so a lot faster than I. 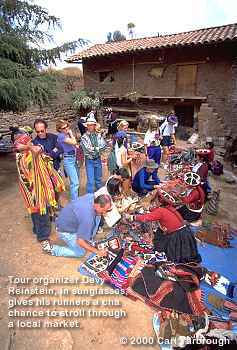 We are here, seventeen of us, to enjoy the natural splendors of Peru, explore the local culture, and learn about Perus Inca past. This is not unusual. 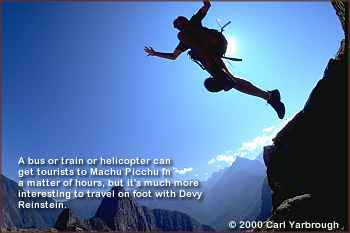 Since the government has largely quashed its number-one public-relations stumbling block (the now-subdued Shining Path terrorist group), tourists these days are coming to Peru in droves, most of them making the pilgrimage to Machu Picchu, the lost city of the Incas. But these visitors generally travel by bus, helicopter, or train. Our itinerary calls for us to run, and not because we are late for our bus. We have signed on to run the Inca Trail to Machu Picchu and beyond along wind-swept rivers, through damp cloud forests, up and over blustery mountain passes because we want to. At least running is what my new friends came to do. As Bob Graham, a fifty-six-year-old emergency-room doctor from Connecticut, tells me, "Running is a great way to explore a place. You see things you wouldnt normally see." Like everyone elses rump disappearing up the trail. Only a few days into the trip, we have already established a pecking order, and I am right at the back. Not that anyone cares. My fellow runners and, unlike me, most of them really are runners are distinguished less by their impressive athletic accomplishments marathons, 100-mile races, a rim-to-rim-and-back run of the Grand Canyon with only two pretzels worth of supplies than by their plucky mind-set. Our first night in Cuzco, our starting point before we set out on our run, I sat next to Amanda Zuckerman at dinner. A soon-to-be Harvard graduate, Amanda seemed quiet and shy. She had recently spent six weeks trekking in remote Nepal, an experience that included a close look at the butchering of a goat. My heart went out to this delicate girl. "Surely," I commiserated politely, "that must have been a hard thing to watch?" "Six weeks without protein," said Amanda. "I would have butchered it myself." Earlier that same day, Becky Warren, another member of our group, had been hit by a taxi. "I got up," said Becky, "and everything seemed to be fine, so why not just move on?" trailhead. But most days we are on the run, anywhere from four to eighteen miles, most of them at altitudes ranging from 7,000 to 16,000 feet. Something else about altitude. It requires climbing to get there. "There will be a few climbs," warns Devy Reinstein before we start. "Nothing is completely flat in the Andes." Owner of Andes Adventures, purveyor of this unique tour and traditional hiking trips as well, Devy proves to be an organizational genius. Wherever we go, Devy is barking into radios and cell phones, managing hotel and restaurant reservations (seven nights of the trip are spent camping, the remaining nights in towns along the way), setting up bus and helicopter shuttles, and orchestrating the movements of fifty-seven porters who somehow have camp and a hot Peruvian meal ready and waiting when we arrive in nosebleed places. Though possessed of the energy and organizational skills of George Patton, Devy apparently lacks the gene for judging difficulty, time, or distance. Eventually we settle on a system for deciphering Devys assessment of our upcoming day. "Take anything he says and double it," suggests Bobs wife, Betsy. The fact that we might be longer on the trail than Devy suspected bothers no one. Like any wise adventurers, my companions recognize an elemental fact of exploration. The longer you are out there, the more time you have to enjoy it. And there is plenty to enjoy. We spend our first two days in Cuzco. Once the capital of the Inca Empire, Cuzco remains South Americas oldest continuously inhabited city, a place where present and past swirl about each other in a sea of red-tile roofs, 500-year-old churches, and even older stone streets. We tour cavernous Spanish churches heavy with gold and wander about museums where mummified royal families squat in the fetal position so that they might be easily reborn. The history is interesting, but I enjoy present-day Cuzco more, which is why, when Devy hands us a pass to Cuzcos rash of museums, I stuff it in my pocket and discover a lively town instead. The Incas knew Cuzco as "the navel of the world," and it remains a maelstrom of activity today, with frying meat smells spilling from restaurants, boys kicking soccer balls up steep sidewalks, painters working inside shadowy doorways, and streets upon which no auto insurer in its right mind would ever venture. In Cuzco we also meet Eddie Pizarro. Our guide for the trip, Eddie is a native of Cuzco. He studied tourism and Inca history at the Universidad Andina Del Cuzco, and is a wealth of Inca information, at least what information there is to tell. What is known? Without formal tools or written instruction, workers and craftsmen quarried stones, hauled them improbable distances, and then cut them so they folded upon each other like lovers, creating buildings solid enough to withstand the fervent wrath of nature (Peru has suffered powerful earthquakes) and the Spanish. "So perfect," Eddie says, "the Spanish thought the Incas were devils." Endowed with a Zenlike calm and a ten-year-olds sense of fun and wonder, Eddie obviously enjoys the mystery that overhangs most everything he tells us. There are some things, he says, we can count as fact. For instance, that Inca was actually the name of the godlike rulers descended from the son of the Sun, and Quechua (pronounced "Catch-wa") was their culture. Beyond that, well& . "People guess about everything." He shrugs. "UFOs. Aliens. You can make your own theory because nothing is proved." Cuzco is interesting, but the real magic begins when we get out on the trail. Few places rival Perus natural beauty, and few places give you a better gander at it than the Inca Trail to Machu Picchu. From its jumping-off spot at Chilca, the trail is only thirty-three miles long. But it winds through a potpourri of stupefying natural wonders. Perus mountains dont hump into the sky; they sheer straight up, like mossy shark fins. Far below, amidst a broccoli-mass of trees, rivers glint like silver thread. Between the two, birds wheel gracefully in stomach-lurching space. Now and again, as we round a bend and the world drops away below us, we see, on a grassy bluff or a near-sheer terrace, temples crafted from cow-size stones, and Eddie smiles as he points out that the nearest quarry was twelve miles down and away. "We have to change the mind just a little bit to understand these people," he says. Or as Liz Sotoodeh puts it, grimacing as the two of us huff up toward 13,779-foot Warmiwañusqa Pass, "I just wish I was pulling a boulder." We carry almost nothing, and I try to keep this in mind as we climb. Actually I have felt surprisingly good since we hit the trail, a spring in my step I attribute partly to the running I did before the trip, partly to my decision to walk most of the trail. Certainly its difficult to run, especially when the trail goes mountain-goat steep. But I walk mostly because running seems to defeat the purpose. Much of the Inca Trail to Machu Picchu is uneven stone; running requires careful attention to footing so as not to twist an ankle. With such scenery erupting about us, it seems silly to stare at the ground, an attitude many of my companions adopt. "The running is secondary to the culture," says Ed Wehan, who once ran 100 miles in nineteen hours but now moves at a mall-walkers pace. "You can picture the Incas, get a feel for the country by being out in it." Run or walk, as we ascend toward Warmiwañusqa Pass, most of our group is rasping, one is barfing, and Ed is singing. "Tiiiiired of living, but scaaared of dying, that old man river he just keeps on rollin& ." butterflies; wide, grassy pampas; and, atop Warmiwañusqa Pass, a Scottish-moorlike scene in which a cold wind sends cannonballs of gray fog gusting past. That evening, standing outside my tent at Phuyupatamarca, I watch the setting sun paint orange cloud swirls, then touch the snowy mountains soft pink. Later, over the rim of those same mountains, we see lightning detonate in bright explosions. Eddie points out the shapes of animals woven into the Milky Way while the cold stings our fingers. "Just for us," he says. This isnt entirely true. When we summit a last steep pitch of trail the next day and look down at Machu Picchu from the Gateway of the Sun, the lost city of the Incas has been found, by swarms of tourists in buses that belch their way up and down the mountain. The sun god sent man and woman to civilize the world, and they have done far too good a job of it. Still, it all feels right. Later Eddie tells me that the view from the Sun Gate has, at times, moved him to tears, and I doubt they were tears of regret. Peru is far from spoiled; our merry bands second week in the wind-swept Andes will confirm this. Standing at the Gateway of the Sun, gazing out into a world of smashing blue, one could see Machu Picchu, and the world around it, as a Quechua pilgrim might have seen it. A place where ones spirit might soar. Ken McAlpine, a frequent contributor to American Way, has also written for Sports Illustrated, Outside, and The Los Angeles Times. Carl Yarbrough has been an editorial photographer for twenty years. His work has appeared in Sports Illustrated, Outside, and National Geographic Adventure.